Sen. Heidi Heitkamp, D-N.D., laughs with an attendee at an event sponsored by the West Fargo Police Department on Aug. 7. Heitkamp is one of 10 Senate Democrats facing re-election in November in states President Donald Trump won in 2016. It is a tricky strategy. But Heitkamp believes her personal warmth, energy and independent credentials are better qualities for a U.S. senator than a record of voting 100 percent with Trump. "You know I can only be who I am," Heitkamp said in an interview on the campaign trail in North Dakota. "I think why people like me is that I only am who I am, and that I've only been out there fighting for North Dakotans. I don't have a tribe that I'm representing except the state." That seems to come naturally for Heitkamp. She's the kind of politician who lives for parades and county fairs, who exudes the energy of a football coach and has an affable, neighborly greeting for everyone she meets. It's something she's famous for across the state. Her opponent, Republican Rep. Kevin Cramer, says personality and independence aren't enough to win in a state like North Dakota, where Trump remains hugely popular. "If you were to ask me what her biggest challenge is, it's damn near insurmountable without changing parties," Cramer said in an interview. "She is a Democrat, and that is a — that is nearly a fatal political flaw in North Dakota right now." Heitkamp sees it as a feature of her campaign, not a flaw. "I say if you want someone who is going to vote with the president 100 percent of the time then I'm probably not your candidate," Heitkamp said. "I don't think the president is 100 percent right. I don't think anyone's 100 percent right. My vote belongs to you and not to a political party." She says that kind of honesty is a key to her appeal. It doesn't hurt that many people here just seem to like her. Her straight-talk approach and ease with retail politics was on full display on a recent night in West Fargo, where she and Cramer were both out meeting voters at an event sponsored by the police department. 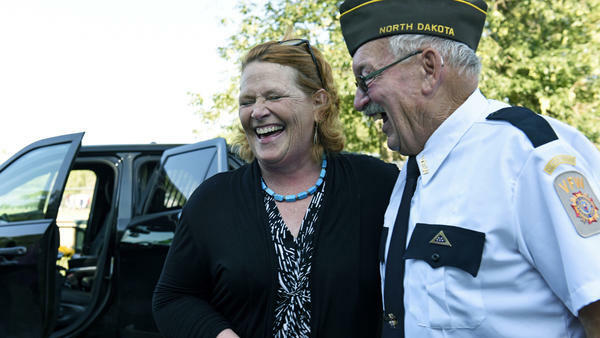 From the moment Heitkamp arrived, she appeared in her element. She was shouting greetings to volunteers, taking selfies and joking about taking a turn in the dunk tank. "No I'm not going in there," she said, laughing. "I did that once — people were having way too much fun ... even if they don't hit it right, they still go over and press the button!" Just a few yards away Cramer was waiting for a flag ceremony to begin. Cramer and Heitkamp often cross paths back home while they campaign, and on this night their differences couldn't have been clearer. Where Heitkamp is buoyant, Cramer is subdued. It's a contrast highlighted in the first five seconds of his latest campaign ad. It opens with retired Air Force Lt. Col. Patricia Traynor, sitting around a table in a pool hall with a group of mostly older, male veterans. "I like Heidi," she says. "Who doesn't like Heidi? But I don't like the way she votes in Washington." Aides for Cramer say they spent "six figures" to air the ad on TV and radio for two weeks — a fairly hefty sum in a state without the expensive media markets of major cities. The incumbent congressman's margin of victory grew to 45 points in 2016 as the state shifted even further to the political right. His pitch this year is that he is a reliable Republican in an increasingly red state, voting with the party on everything from abortion to taxes. And he has Trump to help him undercut Heitkamp's centrist message. Trump came to North Dakota, telling voters at a rally that Cramer's vote was necessary to enact the full Trump agenda — like moving the Supreme Court further to the right. "We need Kevin Cramer to replace liberal Democrat Heidi Heitkamp in the Senate," he said. "Heidi will vote 'no' to any pick we make to the Supreme Court — she will be told to do so." That message resonates deeply with voters here, particularly as Democrats are fighting to block Kavanaugh's confirmation. Heitkamp broke with party leaders to be one of the first Democrats to meet with Kavanaugh on Wednesday — and she also has taken to openly embracing Trump in her own ads, including one that aired across the state this summer. "I'm Heidi Heitkamp, and when I ran for the Senate six years ago I said I wouldn't vote the party line, because I don't think either party has all of the right answers," she says, looking directly into the camera. "That's why I voted over half the time with President Trump." "I think the easiest thing in the world is to pick a team and run to that side and jump up and down and say, 'Look at me,' " Heitkamp said. "The hardest thing in the world is to try and figure out how you can bridge the differences." North Dakota's relationship with Trump is complicated. For one thing, farmers are anxious about Trump's aggressive tariffs and a looming trade war with China. Angy Bartlett is mayor of the tiny town of Courtenay, in the middle of miles of farmland about two hours west of Fargo. While she's not a farmer herself, Bartlett says the tariffs are on everyone's minds. "My livelihood comes from the farmers, so yeah — yeah, we're concerned about all of that," she said in an interview. "The farmers are our bread and butter in these small towns in North Dakota. So we need to take care of them." Bartlett doesn't call herself a Democrat, but she's voting Heitkamp this year. The tariff message helps, but Bartlett says she likes that Heitkamp is from a small town, cares about farmers and is personable. People also seem to like that Heitkamp is an independent voice. The question is if enough people like that. "I think Kevin Cramer's whole history in service has been running to one side and not trying to bridge the gaps," she said. "And if someone like me can't get elected to the United States Senate because I'm too moderate, you know, I don't know what happens for governing later on."